Centrally situated and close to the freeway makes for an easy 8 minute drive to the Airport or 5 minutes to the main beach, Casino and Aquarium (Bayworld). Greenacres shopping mall, CBD and St Georges Hospital only 2km away. Closest Supermarket and Petrol station less than 1km and the Nelson Mandela Stadium less than 3 kilometres. Richmond Hill is known as the culinary centre of Port Elizabeth with various restaurants, coffee shops and bars all within easy walking distance. Willow Cottage Bed and Breakfast is owner managed and suitable for the traveller or business person who prefers a cosy homely atmosphere but also appreciates their privacy. 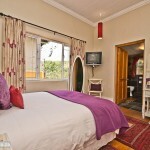 Willow Cottage is situated at 27 Campbell Street in the historical suburb of Richmond Hill, Port Elizabeth. 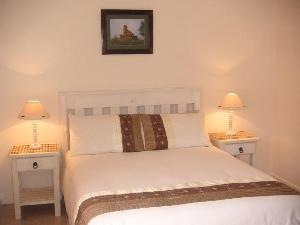 Willow Cottage boasts a warm friendly atmosphere typical of these old historical buildings. We offer three double en-suite bedrooms, two with private entrance from our front veranda and one en-suite family room with king-size and single beds. Guest rooms furnished with antiques and collectibles from days gone by, soft cotton percale bed linen and quality beds provide our guests a snug and relaxing night’s sleep. All guests are supplied with luxury towels and bathroom amenities. All rooms are equipped with TV with SABC and eTV channels, DVD player with DVD library, coffee making facilites, hair dryer and fan, thus ensuring that our guests are provided with all the comfort and luxury they need for an enjoyable stay. Our rooms are serviced daily. The exposed brick walls and beams in the self catering open plan studio dates back to when the house was built in 1874. The Studio sleeps 3 adults and one child comfortably in double and single beds. The Studio has a wooden deck with harbour and sea views. The stairs leading up to the unit unfortunately make it unsuitable for the elderly or small children. The Studio is serviced Mondays to Saturdays and not on Sundays or public holidays. DSTV available in the guest lounge, wireless internet and swimming pool. Full buffet breakfast served in our dining room from 07h00 to 09h00 daily. Early bird breakfast, lunch pack and dinner available on request. Physical Address: 10 Zareba Street, Richmond Hill, Port Elizabeth, Nelson Mandela Bay, South Africa. 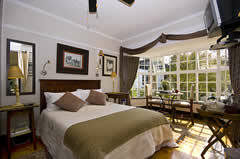 The Newton Guest House is situated in Hurd Street, Newton Park, Port Elizabeth, Nelson Mandela Bay. We offer a safe, quiet environment, catering mostly for the corporate businesses in the area. The six rooms are built around the swimming pool, across from a spacious dining area where a full hot or cold breakfast with all the trimmings is served every morning. Newton Guest House is the preferred choice for corporate businesses in our area, including: Canon, ABSA, FNB, Vodacom, MTN, Toyota, Nedbank and Coastline Packaging. Close to Restaurants, Airport, Shopping Centres – Moffett on Main,Walmer Park – Schools, Banks,Hospitals, Beachfront, Entertainment Centres, NMMU (Nelson Mandela Metropolitan University) and other places of historical interest. Being on the Main Road, there is easy access to all main routes. We offer top quality accommodation, at an affordable price, in our Guest House which is ideally located in Walmer, within 15 minutes from all major attractions. We are 5 km’s from the airport and 9 km’s from the beach front. We are a mere 5km’s from St. Georges cricket ground and St. Georges Hospital. 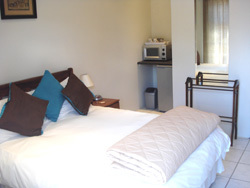 We offer our guests value for money and comfortable accommodation in a safe and secure environment. Enjoy our truly divine breakfast or stay on a bed only basis and visit one of the too numerous to mention restaurants or coffee shops “down the road”. However, you do not have to venture out for a delicious snack or home cooked meal. Each en-suite room has its own separate entrance. All rooms are equipped with satellite TV (DSTV bouquet), fans, safes, hairdryers, tea/coffee making facilities and bathroom amenities. Pool and braai (barbecue) facilities. On site parking and the premises are under 24 hours CCTV surveillance. Light refreshments are available on the premises. Homeleigh Halt has a total of 6 rooms, each one unique and individually decorated. 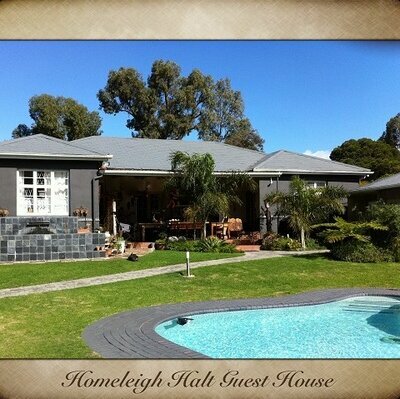 Our highly recommended guest house offers you a choice of accommodation from standard to deluxe and self catering options. All rooms are ensuite with own entrances, satellite TV (DSTV commercial bouquet, this includes 3 Super Sport Channels) hairdryer, fans, tea/coffee making facilities, safe and bathroom amenities. Each room has an area suitable for paperwork. Guests are otherwise welcome to work in the guest lounge where there is an ADSL internet connection or on the patio overlooking the pool at the huge table where there is ample lighting. Our beds are of the highest quality and dressed in crisp 100% cotton percale linen. You are guaranteed a comfortable nights rest. Soft, thick towels will embrace you when you step out of the shower/bath. Each bathroom has a face cloth and towel per guest. Each bed is covered with a plump duvet and a lighter blanket is available either draped over the bottom of the bed or stored in the cupboard. The At Sta-Plus Guest House Bed and Breakfast offers Beachfront Accommodation for the Self-catering Holiday Maker or the Business Person. At Sta-Plus B&B is 2 minutes walk from Pollock Beach, 5 minutes from the Boardwalk Casino, the Humewood Golf Course and the University. Less than a hour away from popular Game Parks like Addo, Schotia and Shamwari in a malaria free environment. A large sheltered swimming pool plus Bar-B-Q facility is available for Guest’s use. Brochures are available of these and many more attractions at the guest-house for your further information. Please contact Mara who will assist you regarding reservations. Looking forward welcoming YOU in our Friendly City of Port Elizabeth.